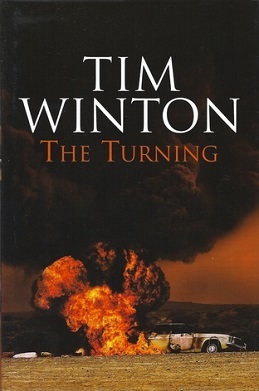 The Turning is a collection of short stories by Australian author Tim Winton published in April 2005. Many of the 17 short stories included interweave in their respective narratives. The story is set in a small Western Australian town and is about all different kinds of turnings. Turnings in people, situations, surprises, accidents, relationships and the turning of time. The turnings come at crucial times in the characters lives. They are doomed and unhappy people and though the turning may not change their lives we see their humanity even if just for a moment. This multi award-winning collection of short stories is used commonly in the curriculum of 3/AB English students in Western Australia. One review summarised The Turning as , "People struggle against the weight of their own history and try to reconcile themselves to their place in the world. With extraordinary insight and tenderness, Winton explores the demons and frailties of ordinary people whose lives are not what they had hoped." Though The Turning may be difficult to read we are emotionally captured by these, "these stunted, unhappy, and sometimes doomed lives, but Winton’s prose is transcendent." The stories show us that when life is at it lowest there is always, "some element of beauty." The Boston Globe wrote, "The writing is frankly brilliant . . . Winton shows us how startling ordinary life is. And he does it in a way that's more amazing than if he had shown a ghost shimmering on the page." and The Times, "'Winton is a poet of baffled souls . . . To read him is to be reminded not just of the possibilities of fiction but of the human heart. " The Turning was developed as a play for the 2008 Perth International Arts Festival. The Western Edge Theatre Projects worked together with the Perth Theatre Company and Bill McCluskey on the production. In 2013, The Turning was premiered as a film at the Melbourne International Film Festival. The architect of the project was Robert Connolly,and the result was that the 18 stories in the collection were each filmed featuring different actors, directors and collaborators. ^ "The Turning by Tim Winton". Good Reads. Retrieved 6 February 2017. ^ a b "A review of The Turning by Tim Winton 2 April 2004". Compulsive Reader. Retrieved 6 February 2017. ^ "The Turning New Stories". Book Browse. Retrieved 6 February 2017. ^ "The Turning by Tim Winton". Penguin. Retrieved 6 February 2017. ^ "The Turning | Perth Theatre Company". Australian Stage. Retrieved 6 February 2017. ^ "The Turning - First Look Review 5 August 2013". The Guardian. Retrieved 6 February 2017. ^ a b c d e "Tim Winton Author". Booktopia. Retrieved 6 February 2017.